The final Stanley Cup victory for the Toronto Maple Leafs – something that may change soon with the latest augmentation of John Tavares – we have a wonderful display celebrating the 1967 championship, with a pair of ticket stubs for the final Cup-clinching Game on May 2nd 1967, along with a 1967 playoffs program. 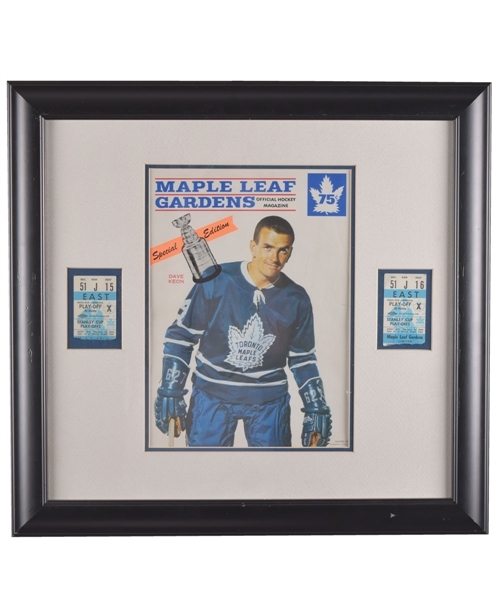 The tickets are in sequence, situated in the “East”, in section 51, while the program (unable to decipher which game) pictures Leafs legend Dave Keon. Matted and framed to full dimensions of approx. 17 ½” x 18 ½”, the ticket stubs both show wear with rough-torn perforations, with light wear to the program including some surface indentations and stray pen marks. The frame also shows light wear as well.